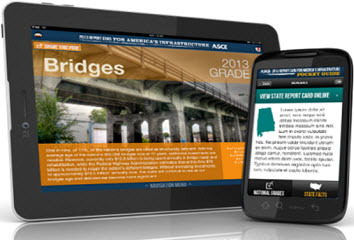 The new 2013 Report Card for America’s Infrastructure is available to download for smartphones and tablets at iTunes, Google Play, and www.infrastructurereportcard.org. In a much anticipated release, ASCE’s 2013 Report Card for America’s Infrastructure gave the nation’s infrastructure an overall grade of D+, showing slight progress from the D in the last Report Card issued in 2009. 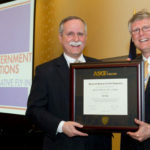 It’s the first time since ASCE started producing Report Cards in 1998 that the grades rose overall and in several sectors. Released Tuesday, March 19, in Washington, D.C., the report provides our nation’s political leaders, policymakers, business leaders, infrastructure stakeholders, the media, and the general public with expert advice from the civil engineering community about the condition of infrastructure across the nation. ASCE has produced four previous Report Cards in 1998, 2001, 2005, and 2009—as well as the Progress Report for America’s Infrastructure, which was released in 2003. These assessments have highlighted the fact that America’s critical infrastructure—principally its roads, bridges, drinking water systems, mass transit systems, schools, and systems for delivering energy—may soon fail to meet society’s needs. 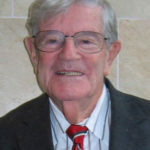 Individual grades were given in the categories of aviation, bridges, dams, drinking water, energy, hazardous waste, inland waterways, levees, ports, public parks and recreation, rail, roads, schools, solid waste, transit, and wastewater. Final grades were assigned based on capacity to meet future demand, condition, funding, future needs, operation and maintenance, public safety, resilience, and innovation. According to Herrmann, the Report Card concludes that to raise the grades and get our infrastructure at an acceptable level, a total investment of $3.6 trillion is needed by 2020 across the entire 16 sectors. Currently, only about $2 trillion in infrastructure spending is projected, leaving an estimated shortfall of approximately $1.6 trillion.